When will Vedanta be ashamed for their misdeeds? 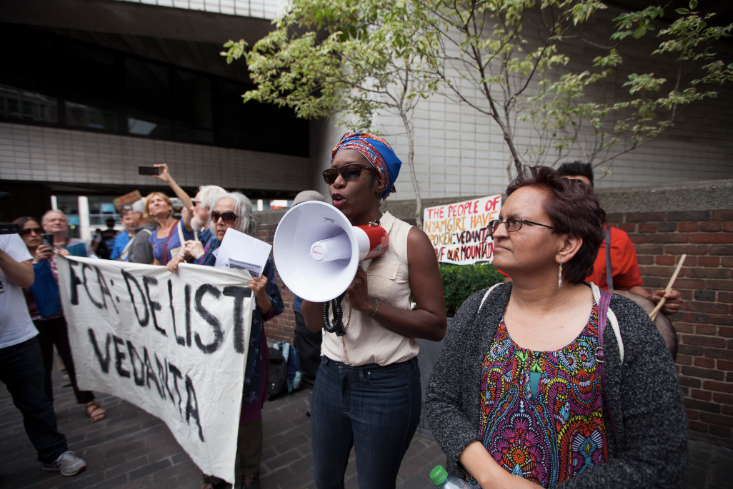 Last Friday we saw fantastic global actions against a British mining company, called the Vedanta Resources, who attempted to hold their Annual General Meeting in London but ended up being interrogated by dissident shareholders. The British mining company, Vedanta Resources, is known as notorious for abuse and destruction in the name of development overseas. According to Foil Vedanta report (2016), Vedanta is controlled and 69.6% owned by Brit Anil Agarwal and his family through a series of tax havens and holding companies. It was launched on the London Stock Exchange in 2003 with the assistance of the UK’s Department for International Development (DfID) and Department of Trade and Industry (DTI), who continue with their support for the company. I witnessed their misery in the AGM on Friday the 5th August. 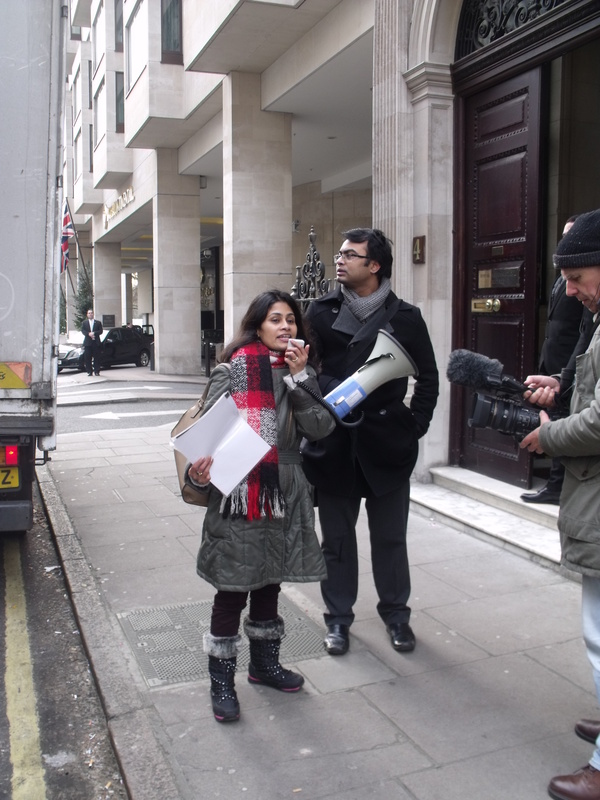 Like every year, protests have been held in India, London and Zambia during the AGM of Vedanta Resources’ at Ironmongers Hall, Barbican, London. 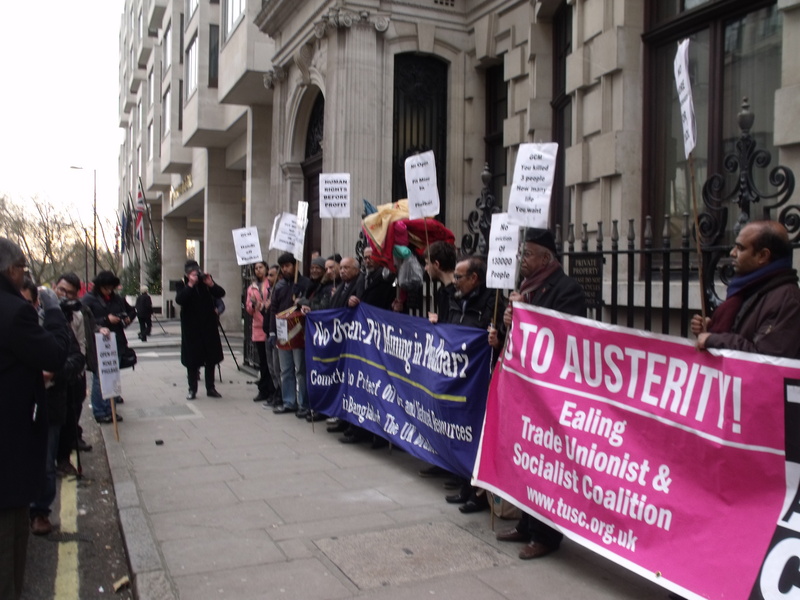 A loud protest outside the meeting was organised by Foil Vedanta and was joined by many southern grassroots organisations and community activists from India, Indonesia, Namibia, South Afrika and Zambia. 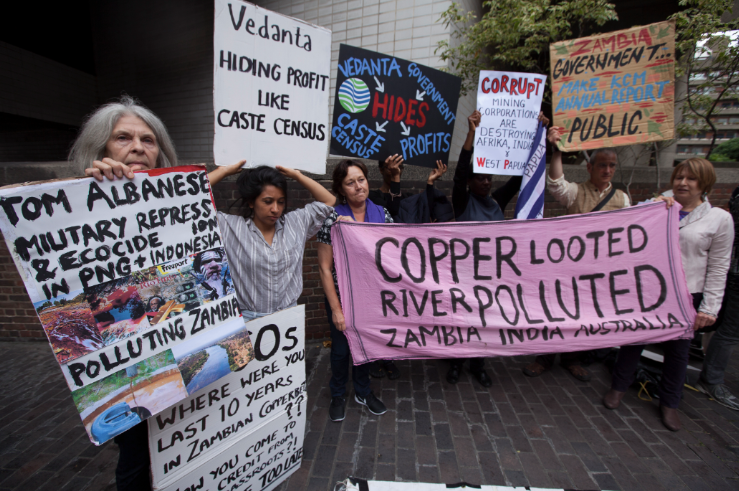 Protesters demanded that Vedanta subsidiary Konkola Copper Mines publish its hitherto secret annual accounts in Zambia. Community activists accused the company of pollution, human rights abuses and financial mismanagement in India and Afrika. At Vedanta’s AGM activists from Foil Vedanta , Phulbari Solidarity Group, London Mining Network and Mines and Communities interrupted the meeting by asking incisive questions to the board. I joined the meeting with dissident shareholders who raised questions on Vedanta’s pollution in Zambia, and human rights abuses and worker’s deaths in India. We asked questions on behalf of the Zambian Copperbelt villagers living downstream of Vedanta’s Konkola Copper Mines (KCM), who have been demanding an end to twelve years of pollution by KCM, which has turned the Kafue into a ‘river of acid‘ and left them with no access to clean water. We asked why KCM has never submitted annual accounts in Zambia in accordance with national laws, and whether Vedanta’s deliberately obstructive approach to compensation cases as revealed in a recent London judgement was company policy. With regard to the serious safety conditions at Bodai Daldali dissident shareholders asked, “whether the mine is one of the certified 48 mines.” Independent and senior researchers who visited the area in India said that seven years ago he had asked about bauxite operations in Chhattisgarh, including the fact that children were working in the mine, which still await answer. Why had researchers and journalists been stopped at the entrance to the site? How can Vedanta make claims in their CSR reports and not even be bothered to share the report with villagers? Most of our questions received no clear answer from the board. Vedanta board, led by Anil Agarlwal, appeared perniciously barefaced in the AGM, and failed to answer important questions concerning the abuse and destruction that the company has been doing to the communities across the south. Instead of engaging with our questions, Anil Agarwal ended up flattering us as ‘ladies first’, ‘I like girls’, ‘I am fond of Bangladesh’ so on and so forth. The meeting began by a rather long introduction by Deepak Kumar, who went into immense detail for around ten minutes over the instructions for use of the handset provided for voting. It followed by the company Chairman, Anil Agarwal’s long speech followed by Vedanta CEO, Tom Albanese’s ever bizarre presentations. In their “sustainable development” report both Mr. Agarwal and Tom Albanese stated that “the priority is”, on the one hand, to focus on “zero harm” and “to ensure zero discharge and waste”, on the other hand. Note this is a mining company that is known as notorious for abuse in India and Zambia. Agarwal insists, even if the company has been causing colossal problems which has landed them in the court, ‘there will be incremental technical improvements that will make things alright eventually’. As Andy Whitmore notes correctly, ‘his slumber is assured by the promise of “zero harm” which is the most peculiar fashion distressing large extractive corporations, or those financing them. But question is: how can a company displacing people to rip up the earth on a vast scale do “zero harm”? He noted further: this attitude is not limited to KCM alone and claimants who have been granted compensation in Talwindi Sabo, Tuticorin and Jharsuguda are also still awaiting payment. Can the board confirm whether obstructing legal procedures and delaying payments is a company policy? Anil Agarwal and Tom Albanese hardly answered the question. Tom Albanese replied that he had a lot of respect for legal processes (just as well!) so he took Cecil’s comments seriously. He said that the 2014 case referred to was a commercial case which was settled amicably last year. In the process of the resolution of any commercial litigation tensions develop which have to be worked through, and it is the job of management and the board to solve problems and Vedanta satisfied the other party. In Zambia, the case was currently being heard in the UK and Zambia. The company had to recognise that the court will go through its own process but the case will be appealed and heard next year. Vedanta’s position is that the Zambian courts are fully capable of hearing a case like this. Albanese said that Cecil had referred to a judgement against KCM, which was related to a 2006 spill, a case which Vedanta recognises went against it. He said that ‘not many people have come forward on this’ (it was not clear to me quite what he meant by that) and it ‘shows that the Zambian courts work’. He said that Vedanta should be respecting the courts in the countries where it operates. Vedanta reports transparently and if people want to know KCM’s financial details, they are in the newspaper. KCM has not been making money recently and has been requiring investment from Vedanta to ensure it is still in a position to hire Zambian employees and contractors. The government has conducted forensic audits and nothing has come out. Albanese said he was confident that the company is fully disclosing its Zambian accounts. From time to time there are commercial disputes. Sometimes they can resolve these things and sometimes they cannot, but they respect court proceedings in Zambia. Cecil drew the CEO’s attention once more to the 1800 Zambian villagers who had recently been given the right to sue the company in London. There was a conversation between Cecil and Albanese about the extent to which Albanese had, or had not, answered Cecil’s questions. Cecil was not convinced that he was being told the truth. That is a suspicion fairly widely held among activists attending Vedanta AGMs. Anil Agarawal concluded the matter by stating, ‘We will follow all the procedures. The matter is sub judice. We are absolutely transparent and whatever judgement comes in we will follow it.’ That would certainly be welcome. As our friend Simon noted later in the AGM, there are questions over the extent to which Vedanta has respected previous court judgements. So the shareholder commented, twice, that he was not convinced that they were telling him the truth. He said that the answers to his questions were partial and that Agarwal did not engage with his questions to the extent that he should have. I did wave my hands at that time but was not given the microphone, probably because they did not consider me as important as male shareholders. The board was, however, populated by male heads. Except one woman (Katya) who never spoke and appeared as a token representative of female members, all 10 heads out of 11 board members were male. Indeed, we had to put up with a gendered corporate board for nearly three hours. Microphone therefore went to someone else. The speaker, representing campaigning organisation ShareAction, asked how the company reports on risks from waste management. But he was frustrated by the answer of the CEO, Tom Albanese, with no surprise. Mr Chairman, both you and your CEO have said that you are committed to ‘zero harm’ and ‘zero damage’ to people, but these people and communities are saying that they are at great loss by the harms and damages that you and your company have done to them. Your company has been destroying many communities. When I was entering the building for this AGM, I have seen community representatives from Orissa, Zambia, South Africa, Indonesia, Namibia and all India were crying outside the AGM that their people have been abused and faced with great loss by the undertakings of your company. I am sure you have seen people’s outcry outside the AGM, too, when you entered the building. What is your response to these people that are protesting outside the AGM? I asked, again to Tom Albanese that I am glad that you have taken the effort to produce a report for the shareholders but I have to say that I am appalled at your presentation because of the level of fraught and misinformation this report involved. I am shocked by the way you have totally overlooked the issues that the May 27th judgement in the case of Dominic Liswaniso Lungowe versus Vedanta Resources and KCM in London which Cecil has just mentioned. This May 27th judgement by Justice Coulson has been a major challenge against Vedanta’s ongoing abuse and misconducts across Zambia, and a big news for the company which the shareholders should be made aware of . I have been reading about this judgement for the last two months as this became important news in London. How was it possible for you to overlook the matter in your whole 30 minutes long presentation? Is this how you can prevent from doing harm and abuse to communities? I would appreciate to have your straightforward and a clear answer to this question. Now I have a second question to both of you (Anil Agarwal and Tom Albanese) in relation to the judgement and the question that my dissident shareholder, Cecil has asked before. May I continue? Justice Coulson’s recent UK judgement on the right of Zambian villagers to sue KCM and Vedanta in London for loss of livelihood and health, revealed that KCM has never filed annual accounts in accordance with the Zambian Companies Act. Meanwhile an UNCTAD report published in July 2016 found ‘systematic export under-invoicing’ of copper from Zambia starting in 2005, the year after Vedanta took over KCM (which is Zambia’s biggest copper exporter). Why have you been keeping your finances secret? What exactly are you hiding from the Zambian government? Tom Albanese replied that when he made a public statement he was making a statement on behalf of the board and is personally liable for it under the law in both the UK and Zambia. He continued, ‘What I say, I say with assurance: we produce and provide transparent financial reports for our operations in Zambia and submit them to the Ministry of Mines and publish a summary in the newspaper, and if you want to see them you can apply to the government and they will send them.’ He said that the other shareholder in KCM’s operations is government-owned ZCCM, so on the board of KCM there are people who represent ZCCM and the government of Zambia. Everything is disclosed. He said he is under a requirement to comply with the law and tell truth about what the company is doing. I asked again whether he really thought the company was doing zero harm. I gave in and wanted to take a break so microphone went to someone else. Several other shareholders raised the issue of ongoing abuse of communities by the company. Some have expressed their concerns to the company reputation as situation is not improving for years. One has expressed his frustration over the answers to his questions from the board for several years which, in his views, discouraged him to ask a question. One (company agent) has accused some of us are causing trouble in the AGM. This shareholder addressed the board as “Sirs” and said that he had been listening to the ‘dialogues’ at the AGM and that these were not really questions and answers. For him, ‘shareholders could have dialogues with the board elsewhere, in “private”‘. People were at the AGM to ask questions on the annual report, and if people were not happy, they should present their views elsewhere, not at the AGM.’ He continued, saying that he had got a fright when the share price went down below £2. He then asked a question about bonuses. During his speech two women shareholders behind me had left the meeting room, and a peer sitting in front of me has smiled while the other peer two rows behind me had nodded off. The Buxi Commission report on the Korba Chimney disaster, which found BALCO guilty of negligence causing at least 40 workers deaths, has now been leaked to the public. Why are you still trying to suppress this report? Anil Agarwal and his CEO had totally misinterpreted the question or deliberately denied to pretend that they did answer his question to their level best. At this point two shareholders who had visited mine sites in India and Zambia had illustrated the differences between the reality and the fantasy of the annual report. They have come back to report on what they had seen. They asked, when will you close down Lanjigarh refinery which has now been operating at a loss for too long due to lack of raw material? At one point a questioner noted he ‘had shown the company’s shiny new “sustainable development” [sic] report to villagers who were shocked by its contents, noting that one person quoted in it – fulsomely praising the company – did not exist in the village to which he was attributed. The board’s primary response was that they would investigate. But this caused more frustration in heated discussions rather than hope, because this was what had been promised before. One shareholder, raising the issue of the appalling lack of health and safety at the Bodai-Daldali mine in the central Indian state of Chhattisgarh noted the issues had been reported before, with promises of investigation, but little seemed to change. Vedanta’s CEO, Tom Albanese, said he was shocked by what he had seen (although the Chair Anil Agarwal seemed to suggest the footage may not be genuine). As was pointed out by the shareholder, it seems head office booked inspection visits in advance; maybe if they really wanted to see what was going on perhaps they should pop along unannounced? After two hours of heated discussions by dissident shareholders and the failure of the board to address the issues in relation to Niyamgiri and Zambia, I got the microphone again and followed from an unresolved question. The microphone was given to me after I waited, patiently, for nearly 30 mins. It was finally Anil Agarwal who asked the person with the roving microphone to give the microphone to me. At this stage he was not only fantasising but also attempted to flatter and flirt with us. Anil Agarwal said to the microphone holder: ‘give it to the girl, this young girl here’! I said: Thank you for giving me the microphone again! I said: I am not a girl anymore! Anil Agarwal said: oh, I know. You are not a girl. You are a lady. I said: Actually, I am a woman. I am quite old! Anil Agarwal, Tom Albanese and Deepak Kumar laughed. Anil Agarwal said: oh, you are old? I did not tell him what’s my correct age but I pointed out that if he wished to flirt, he would have to flirt with an old woman. He changed the topic and said: you are an academic. I like academics’. I said: I am a researcher and a community activist. Anil Agarwal said: yes, yes, researcher. Research is good profession. He was clearly judging my work or me, nevertheless, we let it go. As I wanted to move on to my point, Agarwal interrupted me again and said: You are from Bangladesh, right? I said: yes, that’s correct. He said: I love Bangladesh. I am very fond of Bangladesh. Bangladesh is a nice country. It is rich in natural resources. It has gas, oil, coal and other mineral resources. I said: indeed, yes. But you are not welcome to Bangladesh. I am not inviting you to visit Bangladesh. We don’t want your company to go there to extract our natural resources in Bangladesh. We are rich in natural resources but we don’t want to disturb the soil and the nature by smuggling coals and gas. We don’t want any multinational corporation to exploit us and destroy our natural resources. We have been fighting multinational corporations for years and we have put a decade long halt to a massive open cast coal mine in Bangladesh that you might have heard about. I coordinate a community activist group, called the Phulbari Solidarity Group, which is working to prevent further aggression of multinational companies in Bangladesh. We will be celebrating ten years of resistance in Phulbari and in London on 26th August this year. You can come to our London protest to be held on 26 August, if you like. You can also come to visit my home in the UK, and I can cook for you if you wish to have a Bengali dinner. But you are not welcome to Bangladesh. Anil Agarwal and his board members looked terribly uncomfortable. Agarwal lost words as being embarrassed. He only nodded head by indicating that he got the message. Then I continued, and said: my question is related to my dissident shareholder Samarendra Das who has given us some extremely important information which I found immensely useful. Unlike you, I was not bored. I am rather grateful to him for providing us those useful information that enriched my knowledge on the subject. You said to Mr Das that you don’t have anything to do with Niyamgiri. My question is: will you do a fresh press statement by clarifying that Vedanta will never go back to Niyamgiri in future? Can you put on an official statement on your website by stating what you have just said to Samarendra Das? Can you confirm that it is not in your interest and there will be no future interference from Vedanta in Niyamagiri? I continued and said that my second question is also in relation to Niyamgiri: You have claimed that you will respect the decision of the people who rejected the mine, yet new Mines Minister Piyush Goyal has been making statements about pushing the project through. What are your intentions regarding the Niyamgiri mine? Are you still lobbying the Odisha government to overrule the democratic decision and force the mine through? I continued and said that these two were my main questions though I would love to respond to a shareholder who appeared to have been advocating for an ill process to be practised in the annual general meeting of the company. The shareholder behind me had asked the board to prohibit people to raise open questions. He asked people to stop spending time by raising issues around how the company made its money, and only to talk about the returns to investors and financial issues. Yet he then proceeded to do at great length. In his opinion, we should only raise questions based on the annual report produced and distributed by the company executives. He suggested that we should not comment on anything else, and that any discussion beyond the annual report should be discussed outside the AGM and in private. He thought that we were having a dialogue with the board which he suggested to do in private. He also claimed that dissident shareholders were bored by many questions that some of us have been raising in the AGM today. ‘The shareholder who found our questions and comments are “dialogues” between you (the board) and us (as community representatives) is wrong. We are not here for a dialogue with you. We are here to report the abuse that your company has done to people in various countries. We are here to place oral complaints on behalf of the communities. We are here to question you about why you are overlooking these important issues. There is nothing to get bored about. The shareholder who complained that other shareholders have left the room because they were bored by our allegations against the company did not notice that two people behind me left the meeting during his speech. I have an eye witness here [indicating the security guard/peer who sat in front of me] who noticed this and exchanged a smile with me as the shareholder appeared mistaken. The shareholder who complained about our interrogation and addressed the board members as ‘Sirs’ appeared as an academic at LSE, got furious to me at this point and attempted to interfere during my objection to his deliberate allegation against us. He stood up in the midst of my speech and shouted, despite request of the board to wait, pointing at me disapprovingly. He was asked by board members to allow me to finish my remarks. He raised his two pointing fingers to me and swore by words that I couldn’t hear as I was on the microphone. I continued with my speech and told him that I hardly bothered his unexpected ill-manner and threats. I said that I was there to represent large number of effected communities who cannot be silenced by his masculinity and ill manner. I said that I would continue to speak with all of the shareholders in the room, and not only to the board. The entire meeting room was silent during my speech, and some nodded heads in support of what I said to the misbehaving shareholder from LSE. The board looked truly anxious as they feared further disruption. After my last comments, Tom Albanese and Anil Agarwal told that they want to continue the practice of discussing things openly in the AGM. Albanese said: ‘we encourage people to speak openly and ask questions about anything that the shareholders are concerned about.’ Anil Agarwal repeated the words that People have the freedom to discuss all matters that they like to discuss in the AGM. ‘We believe in democracy and freedom of speech. Everybody has the liberty to talk about any aspect of the company. We believe in liberty’, he said. The meeting had quickly wrapped up by Anil Agarwal’s call for votes. Outside the AGM protesters chanted and drummed for four hours accosting executives of the company as they entered and left the AGM. When Agarwal and other board members had come out of the venue, the protesters surrounded them. But Anil Agarwarl smiled shamelessly, and his gangs left blatant. We don’t know if they will ever feel ashamed for their continuous misdeeds and abuse to communities. The above is my personal account on what happened at the Vedanta AGM on 5 August in 2016. For further details, feel free to have a look at the detailed accounts of other dissident shareholders here . Copyright of all of the images used in this report remains to Peter Marshall. No commercial use o the photos without permission is expected. Thank you! Further coverage in The Mining Journal, the New International, and Reuters. In the month of the climate summit #COP21, when climate protests erupted across the globe seeking climate justice, a London-based AIM-listed multinational company, Global Coal Management Resources Plc. 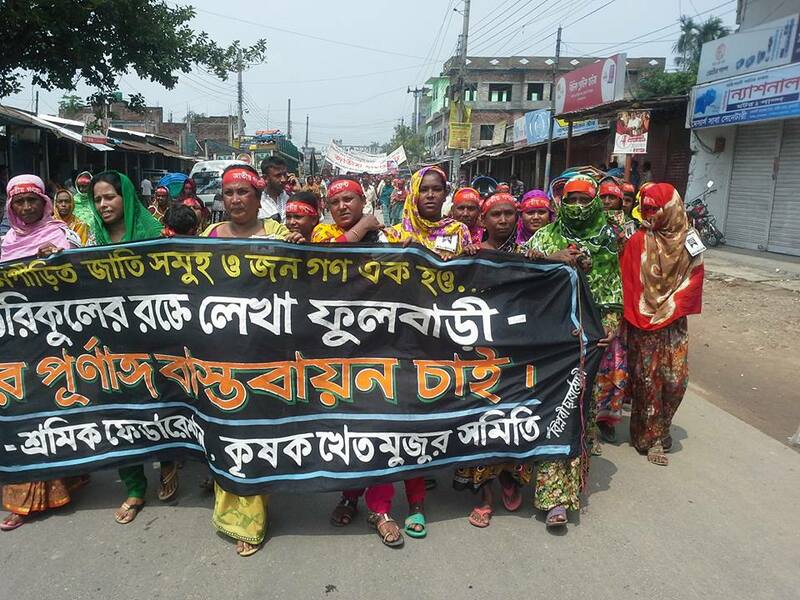 , announced its AGM to discuss a noxious deal to implement a massive open-pit coal mine by forcibly displacing 130,000 families of farmers in Phulbari. If the mine is built, it would destroy 14,600 hectares of highly cultivable land in northwest Bangladesh. It would also pose threats to clean water resources and would leave devastating impact on one of the world’s largest mangrove forests and UNESCO heritage site, the Sundarbans. The mothers and wives of murdered villagers in Phulbari calling the investors of Asia Energy (now GCM) after the shooting on 27 August in 2006. The company, previously known as Asia Energy, has been hotly resisted by locals for its fatal business policy. Three people were shot dead and two hundred injured in a demonstration of 80,000 people that took place in opposition to plans by GCM in 2006. Bangladesh government has cancelled all contracts with the company nine years ago. The government has recently reassured protestors by a statement that it does not want to build an open pit mine in Phulbari. The project has generated grave concern at national and international levels including the United Nations. This year the UK government has published a statement highlighting the fierce opposition to GCM in Phulbari. But the company has so far ignored every message. It has been pushing the government of Bangladesh for a fatal deal. We advise GCM to close business NOW! JOIN US inside and outside the AGM! We will warn them to close AGM forever! Please Bring along your banner, placards, festoons, whistles, drums, masks and messages against dirty coal miners. We will declare a notice of closure to GCM and we’ll celebrate the news that Bangladesh government has reassured there is no plan to open pit mine. It was Phulbari Day on Thursday. It was the day to commemorate mass protests that prevented a UK-based mining company, Global Coal Management PLC, from building a large-scale open-pit coal mine in Phulbari in north-west Bangladesh. Nine years ago, on 26th August in 2006, three brave protesters were shot dead in the mass protest that took place in opposition to plans by GCM, a London based AIM-listed corporation, who wanted to forcefully displace 130,000 people from their homes by grabbing 14,600 hectares of highly cultivable land in Bangladesh. The powerful demonstration in 2006 ended in tragedy when paramilitary force opened fire on a rally of 80,000, people, leaving three people killed and two hundred injured. The 26th August has been marked as a day for commemorating the protesters in Phulbari since then. On the ninth anniversary on 26 August 2015, the day was remembered with respect, as ever, and people’s resistance was celebrated by diverse groups and rights-activists across Bangladesh and in London. 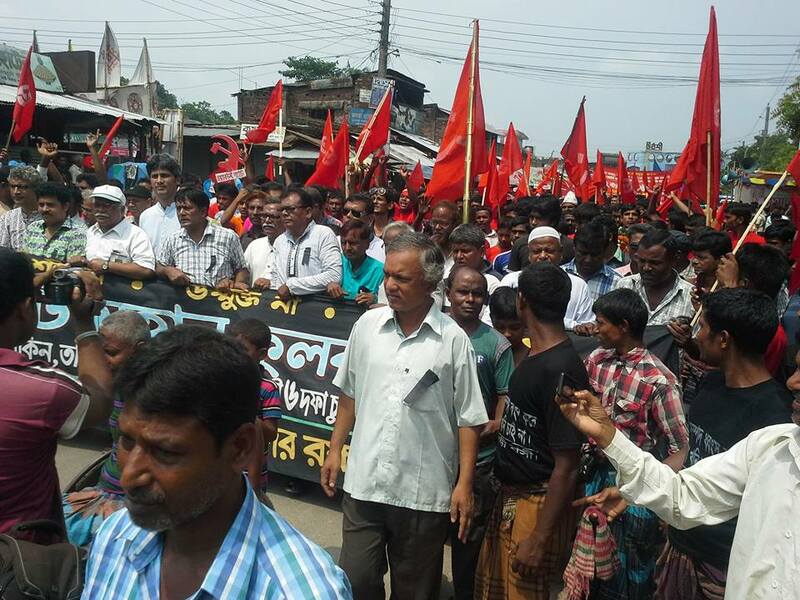 In Bangladesh, campaigners of National Committee at Phulbari, Dhaka, Narayanganj, and several other regions were joined by many other human rights and art groups who paid homage to Phulbari protesters. In Phulbari, nearly ten thousands of people have paid tribute to Al-Amin, Salekin and Tariqul – the three innocent civilians killed by GCM-provoked shooting in 2006. People have started to gather in the town as early as seven o’clock in the morning to pay homage to those who died that day and to celebrate the people-powered resistance that has prevented the massive mine being built for almost a decade. Schools, colleges, shops and business enterprises were shut for all day in tribute to those brave protesters who forced the British coal miners to leave Bangladesh. The procession of homage, initiated by the Phulbari branch of National Committee, was joined by farmers, agricultural workers, rickshaw-drivers, van-store employees, school teachers, doctors, medical students, professionals, art-activists, business entrepreneurs, and of course local leaders of political parties. Parents of the dead, Al-Amin and Salekin, and the injured men including Bablu Roy and Pradip attended the rally in the town centre. Locals in Phulbari called upon the government to remove fabricated cases against leaders of the Phulbari movement. They demanded for an immediate implementation of the Phulbari deal and called upon a permanent expulsion of Asia Energy, the Bangladesh subsidiary of GCM , from Bangladesh. Activists have also asked government to compensate the affected people in Borapukuria mine. Leaders of National Committee announced fresh programme to be held later this year against government’s destructive policy of coal-powered plant in other parts of the country. The rally called upon the government to implement the 7-point demands of the National Committee and to prevent Rampal coal-fired power project from happening which would destroy the countries only mangrove forest and a UNESCO heritage, the Sundarbans. They demanded that Orion coal-fired plant must be resisted and suspended immediately. The same demands were projected in the tribute to Phulbari resistance in other parts of the country, and in East London. 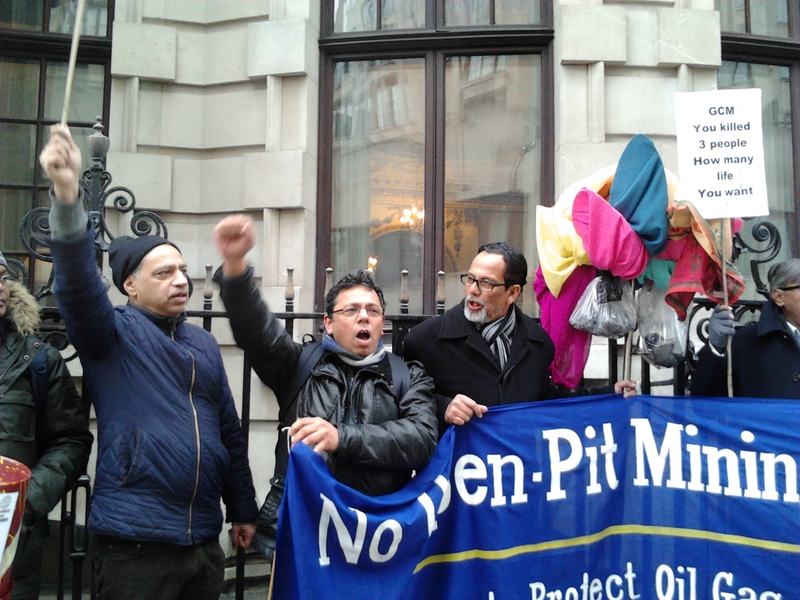 In London, members of the UK branch of the Bangladesh National Committee to Protect Oil, Gas, Mineral Resources, Power and Ports, and activists of Phulbari Solidarity Group were joined by transnational campaigners and environmentalists from Global Justice Now, UNISON, and the Socialist Party of England and Wales. Messages of support and solidarity were delivered by representatives from Tamil Solidarity, National Trade Union and London Mining Network, also. In the meeting at the Montefiore Centre in East London transnational activists have taken a pledge to resist all sorts of conspiracy for coal-fired power in Bangladesh. The member secretary of the committee in the UK, Dr Akhter Sobhan Khan, has updated the forum about development in Bangladesh. That Bangladeshi government has eventually recognised that due to the high population density and the fact that much of the local economy is based on agriculture and other land-based livelihoods, open cast mining is not a viable project for Bangladesh. The forum welcomed this news of a recent statement by Bangladesh’s state minister for power, energy and mineral resources, Nasrul Hamid that the government does not want to use open pit mining in the region. The meeting, presided by Dr Mukhlesur Rahman, has started by following one minute silence in the honour of Al-Amin, Salekin and Tariqul. Participants have discussed recent developments in the campaign against the mine. The Chair of the meeting has updated the forum about the invalid contract between the government and the company. The founder of Phulbari Solidarity Group and an eye witness to the shooting in Phulbari, Dr Rumana Hashem, gave her eye witness to the tragic event and the deadly shootings. She described how local women and men had made the company to leave the area. 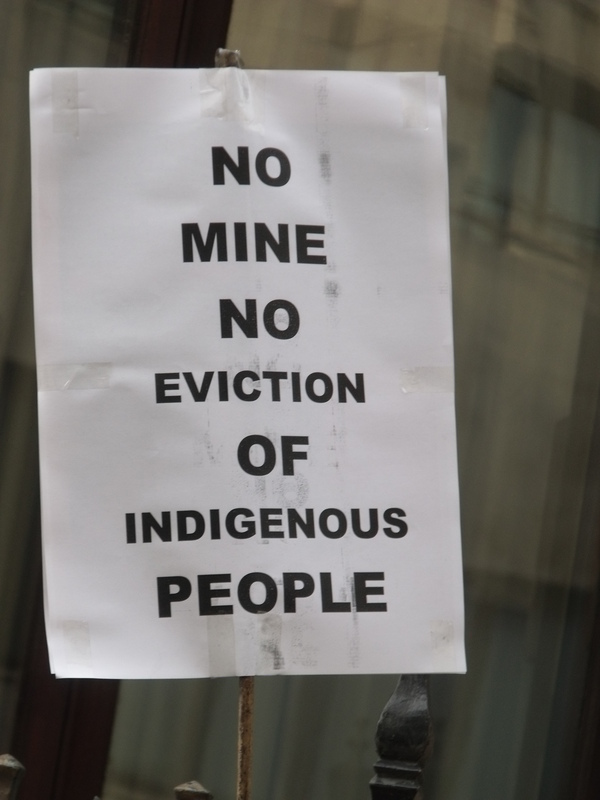 She noted that locals are still vocal against the mine as they recognised that the mine, if built, would cause mass evictions and destroy thousands of hecters of farmland in an area that forms part of the country’s breadbasket. Rumana’s statement was followed by speeches by comrades such as Dr Jinnah, comrade Moktar, Mostofa Kamal, Ishak Kajol and several others. Christine Hague, who joined the meeting to represent Global Justice UK, then delivered a message of solidarity from Global Justice Now, in which she said that Global Justice Now has been supporting the campaign against the mine since 2008. They have been putting pressure on investors, which saw Barclays and RBS withdraw their support, exposing the UK government’s support for GCM and joining protests at the company’s AGM each year. They have also supported US-based International Accountability Project to submit a complaint to the UK National Contact Point for the OECD Guidelines on Multinational Enterprises, in the hope of using this mechanism to hold GCM to account. Although the complaint was accepted for investigation, the UK NCP failed shamefully to consider the impacts of the project should it go ahead, focusing only on the company’s actions in the planning stage to date. GCM was still found to have failed to “foster confidence and trust” in the local community though it was otherwise let off the hook with a recommendation that it update its plans and carry out a human rights impact assessment. This is, as colleagues in Bangladesh noted, likely to lead further unrest. 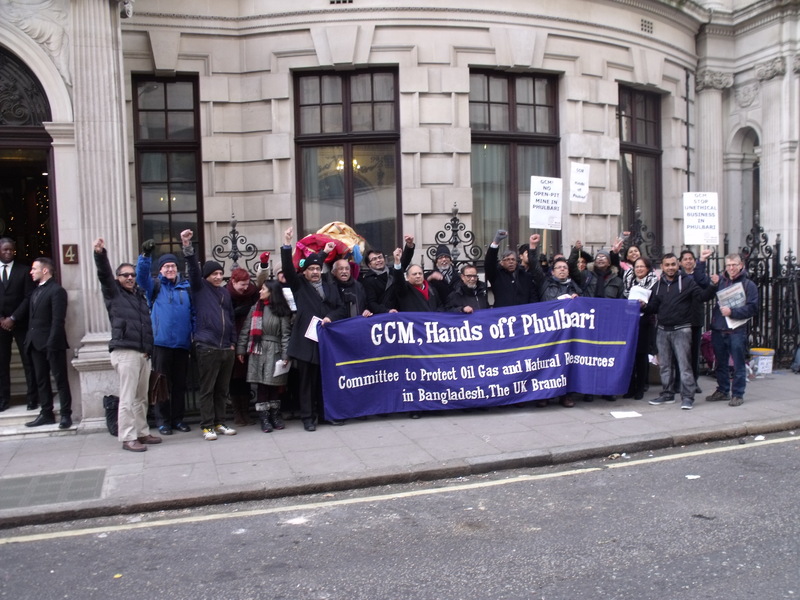 In fact, within four days of the publication of the final statement on the complaint, a visit by GCM’s CEO, Gary Lye, to the area triggered three days of protests and strikes, including an occupation of GCM’s offices in Phulbari. But the failure of high level international mechanisms like this made Thursday’s gatherings in recognition of the mass resistance to the project of Phulbari ever more important. A representative from UNISON, Hugo Piere, told the forum that UNISON would be proud to be part of any campaign or action that the community takes against GCM in future. A full-solidarity has been expressed by both UNISON and the Socialist Party of England and Wales. Likewise, Isai Pryia from National Trade Union and Tamili Solidarity has sent message of solidarity. The message which Helen Pattison of Socialist Party delivered to the gathering states: ‘Although, unfortunately, Tamil Solidarity couldn’t make the meeting today we stand in solidarity with you. We remember the dead and fight for the living. We hope that we will be able to work more closely together in the future’. The meeting has ended with a pledge that any attempt to implement coal-fired plant in Bangladesh will be resisted and solar energy should be promoted. People in both Bangladesh and London have acknowledged that despite the tragedy, people in Phulbari have made an example by preventing the devastating project from happening for almost a decade. It is solid people power. And that’s definitely worth celebrating. The fight for people’s right, nature and environment must move forward. Activists in London have now decided to hold a symbolic protest this September when the Bangladesh’s Energy Advisor Toufiq Elahi visits London. On 3rd August 2015, the world has witnessed another successful year of global actions against notorious mining company Vedanta. Monday’s eight global protests against Vedanta was a very successful day in London and around India and Afrika. 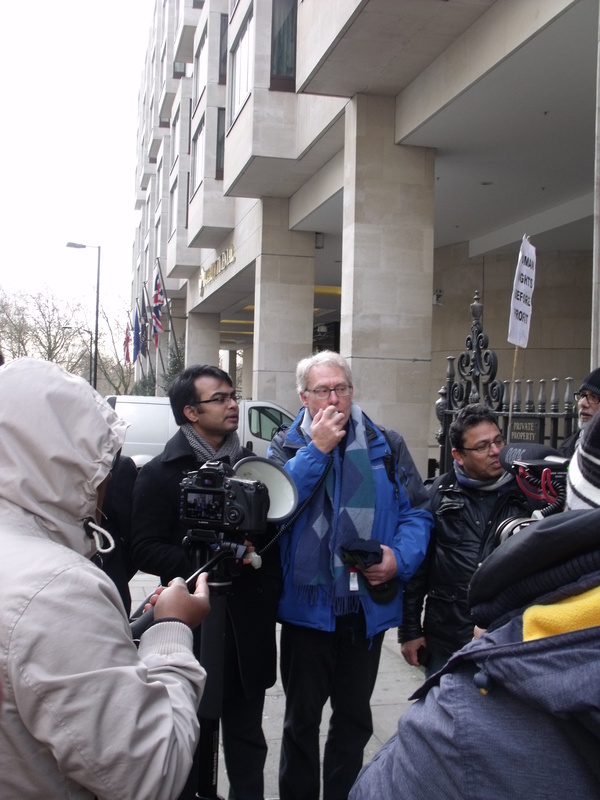 The London AGM of Vedanta 2015 was disturbed by the drumming and chanting outside and questions about pollution in Zambia, illegal mining in Goa, and workers injuries in Tuticorin asked by dissident shareholders. Phulbari Solidarity Group has shown its full solidarity to Foil Vedanta and global protesters against notorious Vedanta. 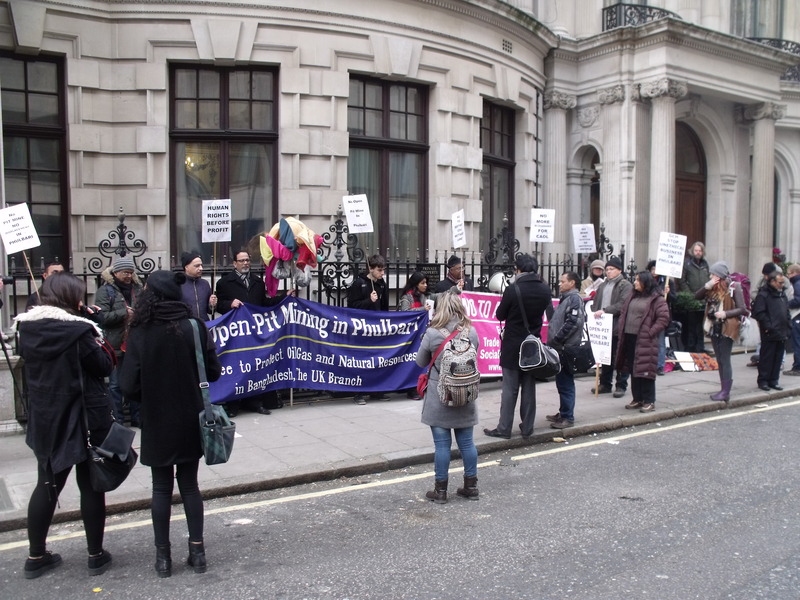 The founder and coordinator of Phulbari Solidarity Group, Rumana Hashem, joined the noise demo at Ironmongers Hall in London, which turned out as a very successful day in London. On Saturday, 25 April, A mass action held in Germany, with over 6000 people coming together to create a 7.5 km human chain that passed through deserted villages in western Germany’s Rhineland to the open cast Garzweiler coal mine owned by the German utility company RWE. RWE was Contracted by GCM as an advisor for the Phulbari Coal Mine throughout project implementation? This very same RWE mine has been promoted in Bangladesh as a model for how open pit mining can purportedly be done in a socially and environmentally responsible way, and there was some controversy generated by sponsored trips for key decision-makers in Bangladesh to travel to Germany and visit the mine. At the time, we noted that claims promoting the mine and RWE as “models” for Bangladesh were contradicted by protests against the impacts of the company’s mining operations in Germany and Belgium. Yesterday, Bangladeshi activists in conjunction with a diverse group of environmental and left political activists in London, heckled the investors of Global Coal Management Resources by their noise demo and coal play. 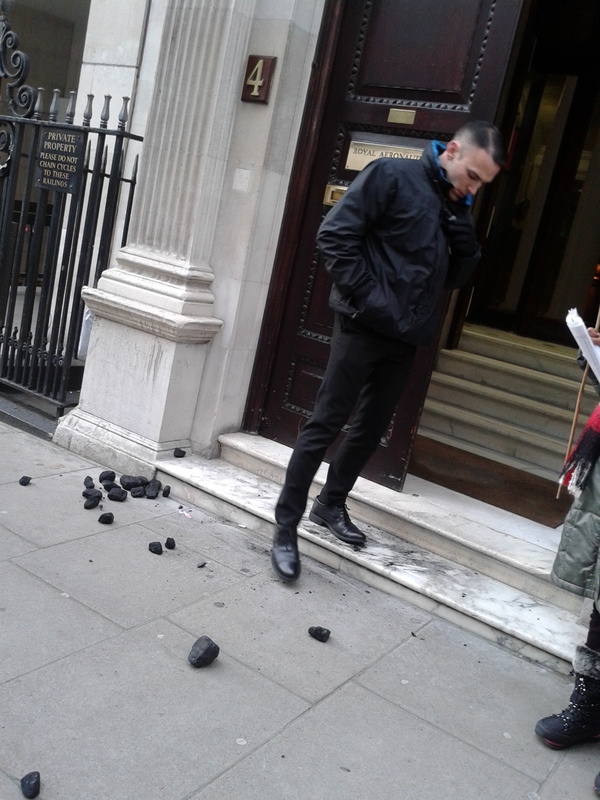 Activists blocked the entrance to the Aeronautical Society by dumping coal in the doorway. They surrounded GCMs’ CEO Gary Lye and his fellows who are aggressively moving ahead to implement a massive open-pit mine in Phulbari, the northwest region of Bangladesh. At the same time a delegation of protesters disrupted the AGM of GCM by questioning the investors inside the AGM about their fraudulent business in London’s Alternative Share Market (AIM). 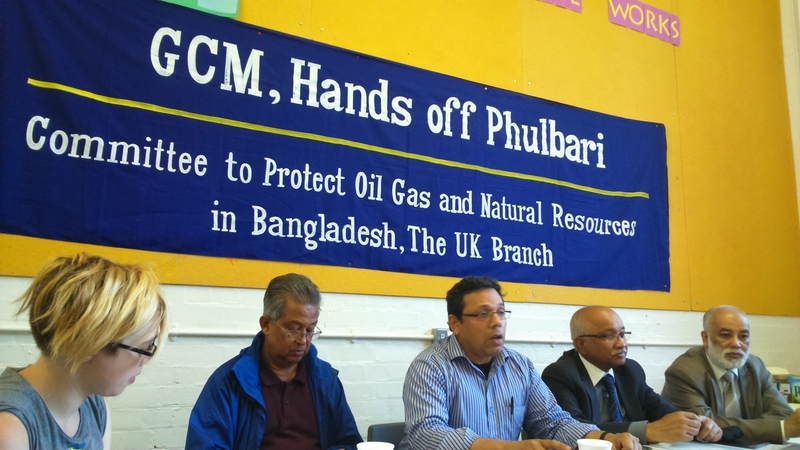 The demo was organised by the UK branch of the National Committee to Protect Oil- Gas-Mineral Resources and Port-Power in Bangladesh, in conjunction with Phulbari Solidarity Group. The event was endorsed by Socialist Party of England and Wales, London Mining Network, World Development Movement, Occupy London, Foil Vedanta, European Action Group of Climate Change in Bangladesh, Trade Unionist and Socialist Coalition, UK, and several community organisations including Nari Diganta, Swadhinota Trust, Udichi Shilpi Gosthi, Jubo Union, Friends of Chatro Union, Bangladesh Workers Party (UK branch), Bangladesh Communist Party (UK branch), and Bangladesh Socialist Party (UK branch). The event kicks in with the launch of artist Stephen Vince’s beautiful sculpture, symbolising the protest against the miners and the livelihood, culture, struggle, and resistance of Phulbari people. 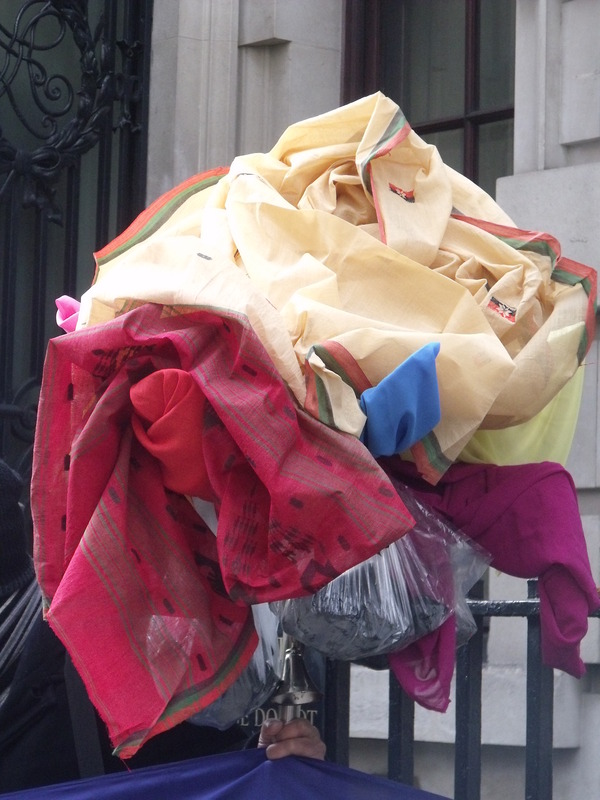 The sculpture, wearing a Tangail and Silk Sari, held three sacks of coals to symbolise the significance of the number three and a tribute to the three people who were killed in the dirty coal game of GCM in Phulbari. Bangladeshi activists, carrying the sculpture and holding a banner saying – GCM hands off Phulbari, No open pit mine in Bangladesh- started to chant slogans and sing ‘tomar bari amar bari, Phulbari Phulbari’. Some protesters played drum and samba when Rumana Hashem and Shahriar Ali gave vocals, deriving slogans from Phulbari in Bangla basat vita dhongsho kore koila khoni hobena [destroying homes and land, no mine no mine]. Others attempted to enter the block calling the investors to come out of AGM and to apologise for their misdeeds and abuse in Bangladesh. Loud protesters were repeatedly warned about potential arrest by the authorities of Aeronautical Society (AS) who did not call police but appeared as racist. 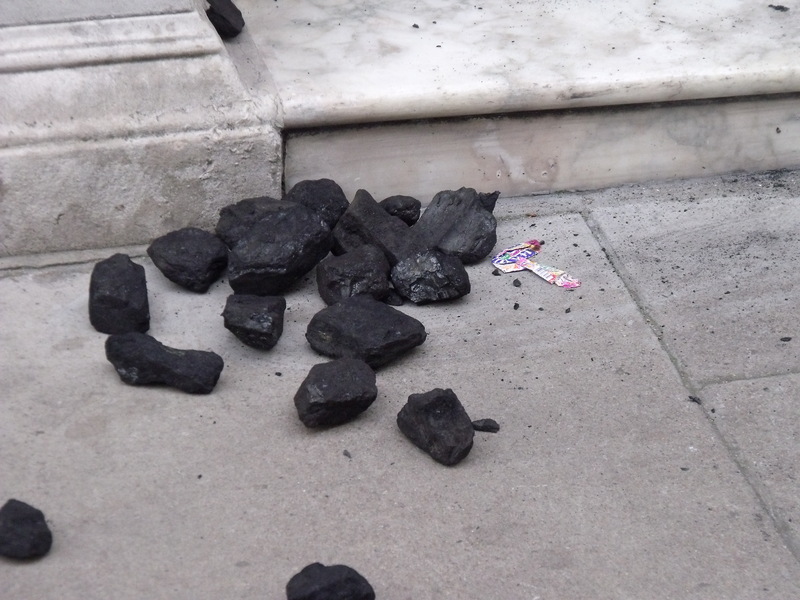 Angry protesters dumped coal on the front door and stairs of AS, as they were prevented from taking out Gary Lye. Protesters said that they would not leave the venue before the interrogation of Gary Lye and his fellows was over. Meanwhile, a group of protesters went to check the investors’ vehicles and took over the car park as part of the blockade against Gary Lye, the company’s manipulative CEO, who was expelled from Phulnari for a 3rd time this year, on 26 November, but still continues to abuse Bangladesh government and Phulbari people. When protesters outside the AGM were checking investor’s vehicles, a delegation of the climate justice activists attending the AGM interrogated Gary Lye and the board inside the AGM about GCM’s unethical business in London and abusive activities in Bangladesh. Bangladeshi activists rattled the investors to an extent that the Chair was fade up and it was Gary Lye who ended up facing the interrogation about the paperless contract and propaganda of GCM. 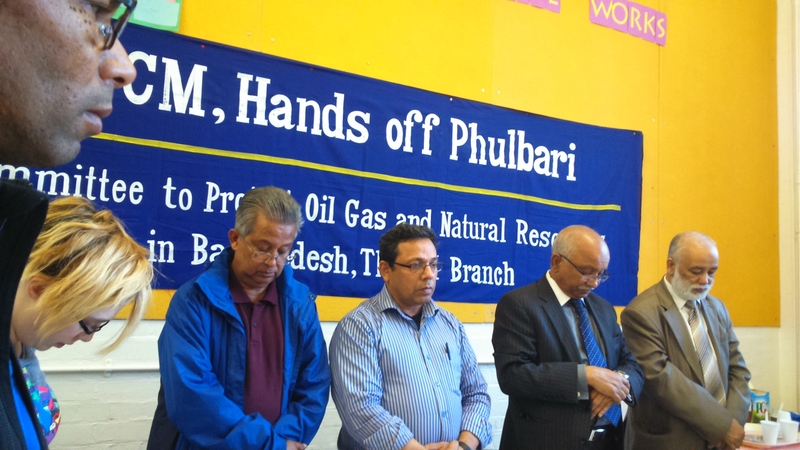 Phulbari activists challenged that GCM does not have valid contract with Bangladesh. 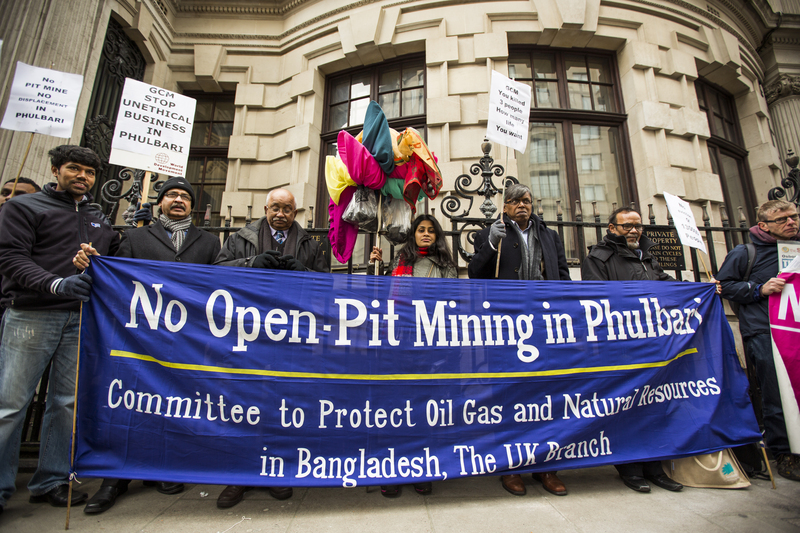 Climate activists of World Development Movement and London Mining Network supported Phulbari activists, and asked numerous questions about the highly contentious Phulbari project, its huge human rights impacts and the OECD Guidelines as GCM has breached 2011 Guidelines, which do apply to the planned conduct of an enterprise in terms of prospective impacts on human rights. Activists said that ‘the company was illegitimate, the project illegitimate and the annual general meeting of GCM was illegitimate’. The meeting broke up unceremoniously and the shareholders broken up into two groups. The delegation of climate activists came out of the AGM and joined the protesters where Golam Mostofa, Richard Solly, Zahanara Rahman and Sam Sender updated the demonstrators that Gary Lye and his fellows have failed to answer the questions of Bangladeshi activists. ‘They are even lying about national media and the government in Bangladesh’, said Mrs Zahanara. Protesters chanted slogans ‘Gary Lye is a Lier, Shame on Gary Lye’, GCM and Asia Energy, hushiar sabdhan [be aware of peoples’ power]’. One angry protester walked into the building with a sack of coal to dump on Gary Lye’s chair, but was prevented from entering the meeting room by the AS’s equally racist authority who received the coal on behalf of the investors. Speakers in the demo asserted that there is no hope for Asia Energy and GCM in relation to coal business in Bangladesh when the government including the Prime Minister, Energy Minister and Energy Secretary of the country have reaffirmed that Bangladesh will not go for open pit mine in Phulbari. Speakers include Dr Akhter Sobhan Khan, Abed Ali, Ahmed Zaman, Ansar Ahmed Ullah, Effie Jordan, Ishak Kajol, Mostofa Farook, Nurul Islam, Peter Mason, Syed Enam, Shah Enam, Julie Begum, and many more. The Masters of the event were Shahriar Ali and Akhter Sobhan Khan Masroor. 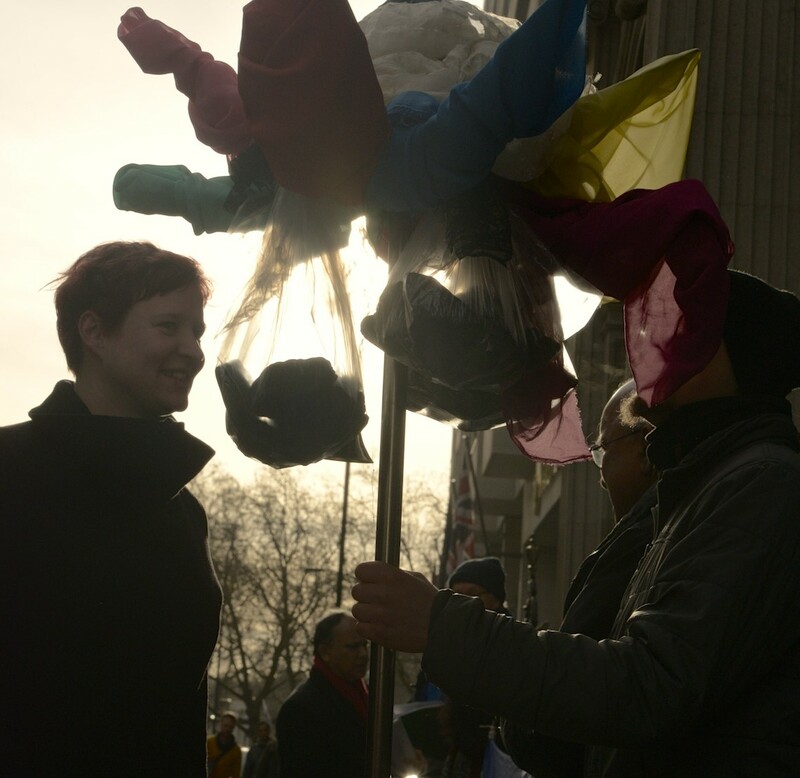 The event was volunteered by a number of left activists and professional photographers including artist Stephen Vince, Golam Rabbani of Diamond Studios, Nicole Meedrum, Patrick, Chris and many more. The chairperson of National Committee’s UK branch, Dr Mokhlesur Rahman, thanked everybody for coming along and for taking on important theatrical roles. 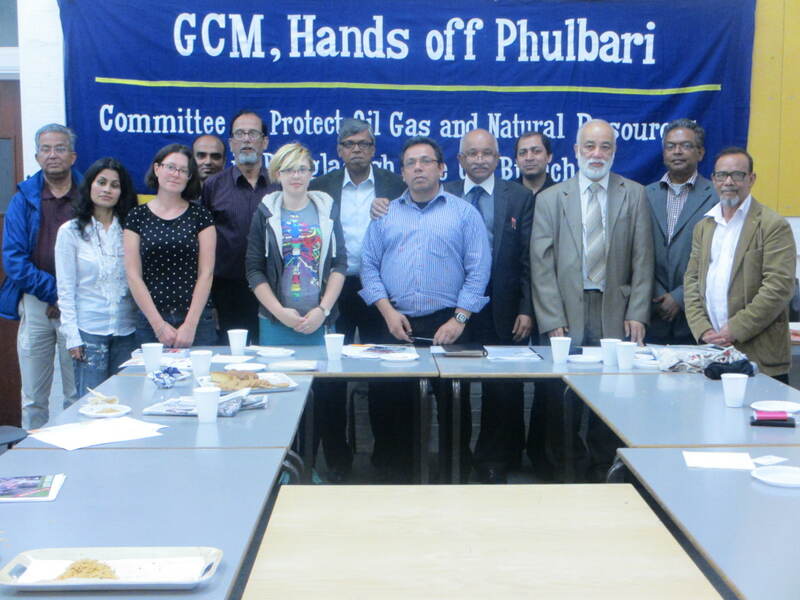 The demo ended with a manifesto calling for an end of GCM’s Phulbari project, and by criticising the UK NCP’s controversial recommendations to the company. The founder and coordinator of Phulbari Solidarity Group, Dr Rumana Hashem, read out the manifesto of the demo and called the London’s AIM to de-list GCM. The manifesto concludes by expressing full solidarity with the Phulbari people’s struggle and by condemning the UK government for failing to hold the UK-based company to account. Miners GCM Resources is the subject of a complaint to the Organisation for Co-operation and Development over the controversial coal mine. They have only one active project, the Phulbari coal project, which awaits permission from the Government of Bangladesh to go ahead. But the people in Phulbari want to put the company out of Bangladesh, ban the Phulbari project and to take the company and its investors to public court for their abusive and fraudulent activities. Phulbari, the town in upheaval in northwest Bangladesh where three people were shot dead during the protest against immense open pit mine in 2006, has become volatile again since, the Chief Executive Officer (CEO) of the AIM-listed British company, Gary N Lye, attempted to conduct consultation with locals in the town centre. There were two days long blockade in Dinajpur-Dhaka highway, and over a thousand people braved cold to raise their protest at Gary Lye’s visit last month. On 26 November, locals in Phulbari surrounded Lye and GCM’s Bangladesh subsidiary Asia Energy‘s local office, and the CEO had to leave Phulbari and Dinajpur in police protection. Violent protests erupted where 2 were injured. Protesters have demanded Gary Lye’s immediate arrest and expulsion from Bangladesh. A month-long programme including nation-wide protests have followed. Protesters will not go back home until their demands are full-filled.